Building & Earth provides a full range of field and laboratory construction materials testing (CMT) services and employs a staff of experienced construction materials testing engineers and technicians that keep abreast of current ASTM, AASHTO, FAA, USACE and other specifications used on a broad range of projects on a national basis. Our CMT laboratories are accredited by AASHTO, validated by the U.S. Army Corps of Engineers, or certified by state departments of transportation to ensure that lab test results contained in our reports are accurate and reliable. 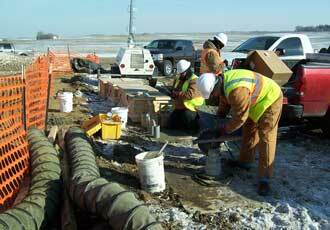 The ability to provide expedient service is crucial to our goal to assist project team members in keeping their project schedules on track. We maintain a company-wide pool of skilled CMT technicians which can be utilized seamlessly by any of our branches to meet their ever changing local workload needs, anywhere they are required. As a result we have the necessary capacity to meet our client’s needs at all times without experiencing the same ‘overload’ conditions that some of our competitors face. This ability stems from our philosophy of celebrating team success rather than individual success.